Our third year of the Story Catcher Writing Workshop and Festival has just concluded, focusing on the theme of “What’s YOUR Story?” What a great group we had once again this year! We learned so much from the session leaders and from the workshop participants in a truly inspiring four days! Our workshop continues to grow, and if you follow the blogs and recaps posted here for the past several years, you will see that we have been able to attract some major talent to lead our sessions–and we have been able to provide a wide variety of activities and workshops for participants. And, as so many of our attendees told me this year, it is all offered at an incredible value. Those of you who participated this or previous years, PLEASE share some of your thoughts and comments at the end of this blog entry. We would love to hear from you! Come join us next June. We will post information and updates here as soon as we have the specific dates set, and the programming established. Dan O’Brien met with his advanced students early on Tuesday morning and put them right to work. In the afternoon Todd Mitchell led a very informative session on beginning fiction, bringing lots of examples and tips from his experiences of teaching fiction and publishing for a wide variety of audiences. (See earlier blog entries for complete descriptions of these sessions and session leaders). Wednesday was JAM-PACKED with sessions, starting at 8:30 in the morning over continental breakfast–the ADVANCED workshop members got to work, while the rest of the participants had the opportunity to work on writing and shaping compelling novels with Todd Mitchell, or “writing the land” with Dawn Wink. After a fun lunch break downtown with more mixing and mingling at the Bean Broker Coffee House, writers returned to afternoon sessions focusing on Science Fiction/Fantasy, Mystery Writing and one author’s journey with her first novel. Day Three: Thursday, June 12, RETREAT! We concluded general sessions on Thursday morning, focusing on Dawn Wink’s session on getting your book published, and Rich Kenney’s poetry workshop. For the afternoon we staged what has become one of the best features of our workshop, our nature RETREAT! This year we journeyed out to Fort Robinson State Park, home of so much history (much of which Mari Sandoz wrote about) and so much scenic beauty. What an inspiring backdrop for writing, hiking, reading, chatting and, of course, eating! We started our journey at the historic dining hall of the lodge restaurant, where most of the group dined on buffalo dishes (tacos, open faced sandwiches, even cabbage burgers–all prepared with bison). We then took a drive to some scenic parts of the park, winding up at the Ice House pond area for some writing exercises and nature walks. We concluded the evening with a cookout at the picnic shelter near the historic parade grounds in the park. What a wonderful, inspiring day! Day Four: Friday, June 13, FESTIVAL! While we are certainly proud of all the wonderful programming we are able to offer at the Story Catcher Workshop, the focus of all we do will always be on the WRITERS who come from far and wide to develop and share their own stories–this is why we conclude each workshop with a day to celebrate the writing of our participants. This year we adapted our “open mic” event to a “table read,” where several volunteers shared their work–and we all shared our thoughts and ideas about continuing to make writing a vital component of our lives. Wrapping up our workshop this year was a wonderful presentation from Ron Hull on his terrific memoir of his colorful and eventful life. “Everybody Has a Story to Tell” was a great way to finish up our event–Ron has a been an ardent supporter of the Mari Sandoz Heritage society and this workshop, and the anecdotes he shared from his book, and the background he provided on the writing process, were fitting words of wisdom to conclude the festivities! 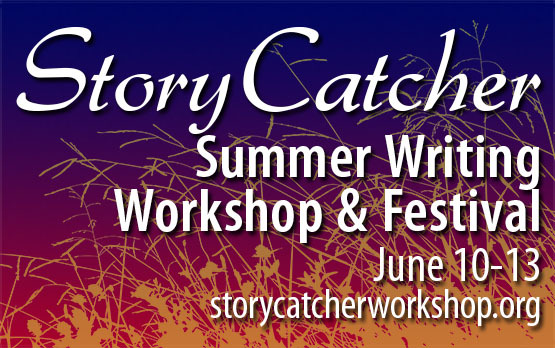 Story Catcher Workshop Is HERE! Workshop Sessions are open to all aspiring writers of all ages and abilities. (We recommend that High School Participants be at the Junior level or above). All workshop participants must pay the general registration fee, which gains you access to all open workshops and special sessions over the four days. There is no deadline for General Registration, and you do not need to sign up for any specific sessions in advance. However, EARLY REGISTRATION IS ENCOURAGED—as materials and notices will be sent out to registered attendees in advance of the workshop.